Stroudbridge Farm is a period farmhouse with medieval origins, built of brick with tile hung elevations under a tiled roof, and located in the South Downs National Park. 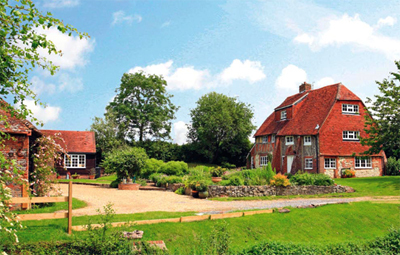 Grade II listed, the house comes with ten acres of land. The farmhouse has accommodation over three floors which is well presented and includes a useful one-bedroom annexe. Accommodation in total comprises: sitting room, kitchen/breakfast room, cloakroom, five bedrooms (one en-suite) and three bathrooms, as well as a studio/games room in the loft. The formal gardens are laid to lawn, behind which is a productive kitchen garden with soft fruit bushes and several trees. A small bridge leads over a stream to a delightful meadow, a wild garden with large pond and a small orchard. There are also extensive paddocks. The farmhouse lies near the Hampshire hamlet of Ramsdean and very close to Petersfield (two miles) which has excellent local amenities. There are very good schools in the area, as well as extensive walking and riding. The guide price is £1.295m. For further information please contact Hamptons International on 01428 769 873 or visit www.hamptons.co.uk.